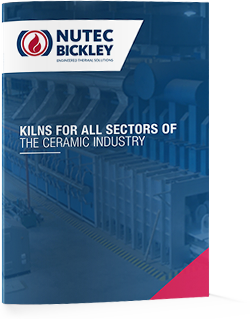 At Nutec Bickley, we design and manufacture kilns for the ceramic industry using leading technology and best practice. We achieve this by utilizing a quality system that assures the continuous improvement of our kiln designs. Nutec Bickley has extensive experience designing and manufacturing tunnel and shuttle kilns for the sanitaryware industry. With the integration of the IMPS® combustion and control system, it is possible to obtain high yield levels in 1st and 2nd firing processes with the lowest fuel consumption. Fuel consumption on tunnel kilns is rated under 1,000 Kcal /kg of ware and on shuttle kilns under 1,700 Kcal/kg of ware, making Nutec Bickley sanitaryware kilns the most fuel efficient in the market. Nutec Bickley supplies tunnel kilns and shuttle kilns for the Electroporcelain industry with the latest technology in combustion and controls to fire electrical insulators under both oxidizing and reducing atmosphere conditions. Nutec Bickley has a vast know - how on designing tunnel kilns, shuttle kilns and Carbell® kilns to fire all types of refractories shapes. Our Kilns for Refractories can be designed to fire refractory materials to up to 1,800°C. (3,200°F). Among the products that are fired in our kilns, we can find: flow control refractories, basic , mullite, silica and high alumina refractories. Nutec Bickley has many years of experience on designing kilns to fire abrasive wheels, segments and special shapes. Tunnel Kilns, Shuttle Kilns and Carbell® kilns can be used for this purpose offering improved product quality and the lowest energy usage. Our kiln design can incorporate a thermal oxidizer to incinerate volatile organic compounds generated during the firing process.